Just wanted to say that you (and everyone that also is involved with this) rocks! Would be cool if it could detect my HDMI automatically as well. Still rocks though ^^. Hans: it will detect HDMI automatically if ALSA and PA show it. Does it show up as a profile in pavucontrol? If so, file a bug against gnome-media, if not, file a bug against your distribution's ALSA package. how to access to this code? Fabio, gnome-volume-manager, as its README would tell you, handles "disk volumes", not sound volume. Check gnome-media instead. The sources are in the gnome-volume-control sub-directory. There's no rear balance per se. Changing Balance and Fade makes changing to all the speakers (except the subwoofer), you can see the interaction by launching pavucontrol for example. lovely piece of work, would it be included with gnome-media? 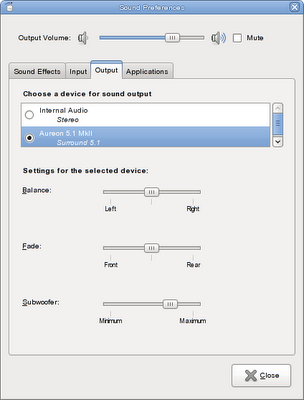 mojo: yes, this PA-based gnome-volume-control is now the default in upstream gnome-media. however, Ubuntu chose to ship the old one by default in 9.04. Fedora 11 ships the new one by default and the old one stuck down in the menus for people who need functionality the new one doesn't yet provide. Mandriva ships only the new one in 2009 Spring, I believe. Not sure about other distros.